I used to entertain a lot in my old apartment in Oak Park. Weekly dinners every Sunday night and holiday parties dotted my schedule. In the two years that I lived in that apartment, I shot mostly film – so between the actual printed photos and all of the gatherings, I had a lot of pictures. And so the ‘Family Photo’ wall was born on the wall behind my couch. 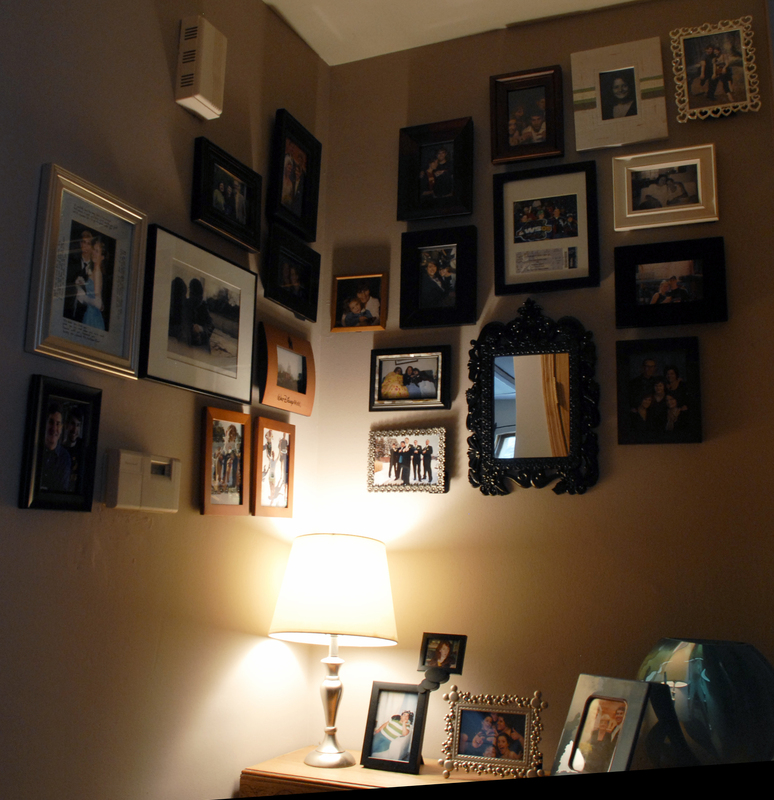 It consisted of an amalgamation of frames and I tried to represent everyone who frequented my apartment. When I moved into the Wilson house that wall was confined to my office (which was later turned into the guest bedroom). It continued to grow as I obtained more frames and photos and eventually overtook a corner of the room. Some of my friends would even give me photos of themselves (usually with me) to add to the wall. My family also made several appearances on the wall. Mike was never a huge fan of the chaotic nature of the wall (the photo frames don’t match and I just hang new ones where there’s space, so there’s no real grid or pattern), but he knew that it was an important aspect of my living space, so when we moved into our new house – we agreed on a place where it could live – and continue to grow. It’s still in a corner – now in the hallway. When I first unpacked all my photo frames and hung them up, there were some empty new frames and the rest were photos of my family, friends and some nice ones of Mike and I. 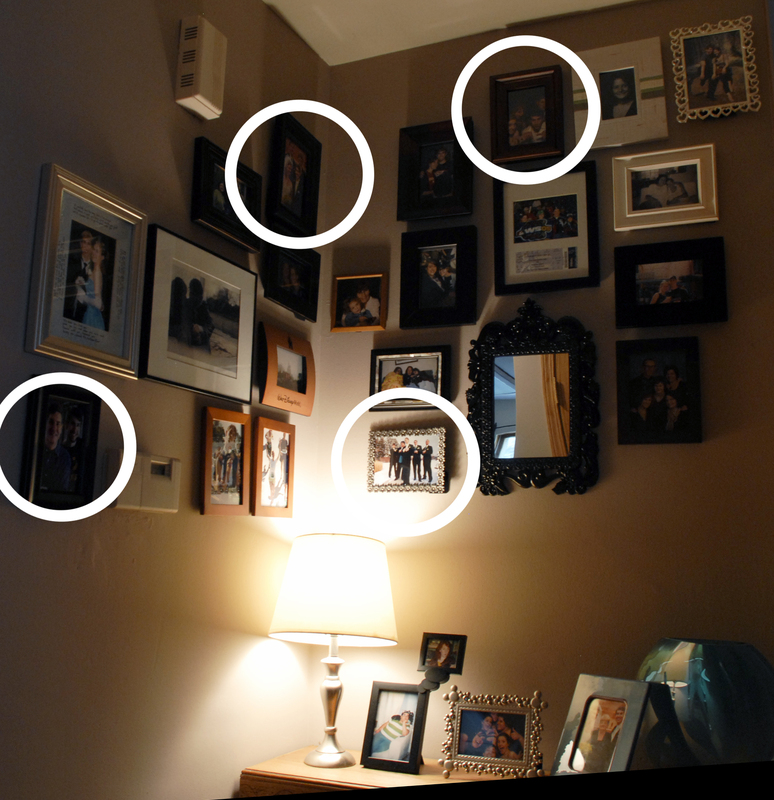 At once I decided that the empty frames would be filled with photos of Mike’s family and friends. This weekend, I got several photos printed for the empty frames in the corner, as well as other rooms in the house. I can’t wait for Mike to get home and see the new faces gracing the corner! I tried to pick photos that he mentioned that he particularly liked. I wasn’t able to get everyone up on the wall that I want represented – but it’s definitely a start. I know that as our family and our group of friends continues to grow the wall will take on a life of its own. Growing up, I always looked forward to mid-August because it meant two glorious words: School Shopping. Maybe I was destined to do work in the field of stationery, because I got way too excited about notebooks and folders in fun colors with fantastic designs on them (Lisa Frank anyone!). And as if picking out which #2 pencils would be gracing my loose-leaf lined paper wasn’t exciting enough – there was a whole new wardrobe that awaited. I’ve been out of school for a little over 4 years now. While I don’t get a whole new wardrobe and notebook selection, I do pick up a few staples for my closet and sometimes a new planner. I’m finding myself in a particularly ‘fall’ state of mind this weekend. While at DSW returning a pretty ridiculous pair of shoes that I had to buy for a wedding, I traded up for a fantastic pair of boots to tuck my jeans into this fall. Later, while I was sitting outside on my parent’s patio I felt, dare I say, a little chilly and made a mental note to bring a light sweater back to their house with me when I returned to watch the Olympic Closing Ceremonies with my parents. Bring on the boots, jeans and layers – I don’t know if I can mentally take much more of the 80 degree commutes to work, which paled in comparison to the sweltering 90s I’d experience on the commute home. You’re not doing your mood any favors when you arrive at your destination perspiring more than after a light workout. Not that I’m looking forward to the blistering cold either – but fall, splendid fall, is what living in Chicago is all about. With fall comes crisp evening walks, watching my brother partake in his various sporting & outdoor musical events, a little more ‘regularity’ to Mike’s schedule (though he’ll protest that his work schedule is anything but regular) and more birthdays than I can count (10 between October 11 and November 1). There’s also the slowly building anticipation to the ‘holiday season’ that contrary to what the retail stores would lead you to believe (Christmas in July sales?!) pretty much kicks off the day after Halloween. Now that there are upper 70s/mid-80s and intermittent rain back in the 10-day forecast, I might give the vegetable garden another ‘sow’ to see if I can garner a Fall Harvest, if we do in-fact have a nice long fall (knock on wood). You may have noticed that my zealous posts about progress in my yard and vegetable garden had been lacking lately. While last summer I over-watered my plants, this summer I just couldn’t keep the garden watered enough for the excessive heat that we experienced in the months of June and July. While I did get to eat my arugula in a delightful salad, and give a bag full to my friend Amanda, I’m more than a little bummed about the beans and pumpkins (who along with the arugula seemed the most promising). So August, keep on being awesome – and lead the way into a stellar fall and exuberant holiday season! Dad and I noticed that our sport sections had different headlines. Both unnecessarily negative. The photo that I took above is an excellent illustration of my point. In the first event that Michael Phelps could have medaled in, he didn’t. Ryan Lochte, another American did. 1) Why did Phelps get the majority of the back page of the Sports Section in the Chicago Tribune – and Lochte, the gold medal winner, get only a small photo? 2) Why did the media decide that because he didn’t medal in one event, that the games were pretty much over for him? 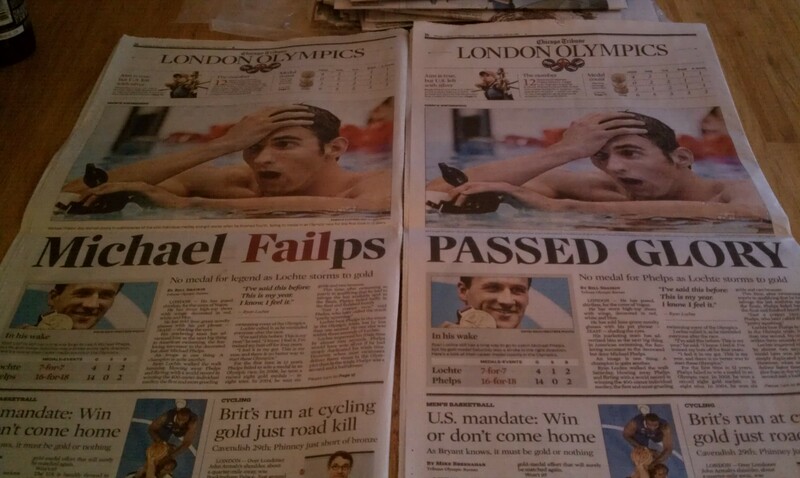 Both of those headlines are wildly inappropriate, especially the one that reads ‘Failps’. This was the first of several times that I noticed the athlete that fell short of their Olympic goal got significantly more coverage than the athlete that met or exceeded their Olympic dreams. Jordyn Wieber also got full-page color-photo coverage when she didn’t make the all-around as expected. It saddens me that the media would rather rub salt in the wounds of those that are still licking their wounds, rather than praise those that might not have a big name, but won gold, or broke a record, or where thrilled to win bronze. Part of the reason the Olympics are so near and dear to my heart is that it is a reminder that the human spirit knows no bounds. These athletes are pushing themselves to be better than their previous selves, direct competitors and previous champions. To go faster, soar higher and compete harder. As someone who will likely never achieve any form of athletic accomplishment in her life, the games inspire me in other ways. How can I apply the essence of the human spirit to my craft, how can I achieve my American dream? Back in the fall of 2010 my dad and I took a journey up to Toronto and the Georgian Bay. While staying in a cabin near the bay we spent our days hiking and exploring several of the parks in that region. At night we’d make a simple dinner together and then spend our evening talking and watching Arrested Development until I fell asleep on the couch – that was the sign that it was time to go to bed. It was a wonderful trip and my dad and I are excellent travel companions. I look forward to whatever our next travel adventure happens to be, but in the meantime, we’ve had an unexpected stay-cation together. This past weekend, my mom and brother embarked on a trip to D.C. to visit my uncle and aunt and to spend some quality time together before Ian starts his senior year and immediately transitions into college. Coincidentally, my sister decided to go visit some friends in NY the following day. So this left my dad home alone with no one to keep him company. Now, it’s no secret that I spend a ton of time at my parent’s house (when your family is as fun as mine is and lives as close as mine does, you just naturally want to spend time with them) and since Mike and I cancelled our cable, their house was a natural choice for Olympic-viewing + spending some quality time with dad. So, since Saturday it’s been mostly me and dad hanging out, watching the Olympics and having dinner together, just like when we were in Canada. And every night I inevitably end up passing out on the couch before finally calling it a night and heading home to get some sleep.